Outreach programs have three purposes. They are designed to let other non-believers know that there is a group who supports a community of non-theists, and that there are many of these groups in our local area. Second, we are there to de-demonize the idea that atheists are evil and immoral. We do not evangelize or shout loudly. We simply stand waiting for other to approach us. Thirdly, we need to let everyone know that we are a minority that has a presence and is growing, and we won’t be going away soon. Come join us! 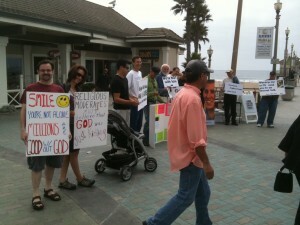 We often visit the Huntington Beach pier, where we offer skeptics and non-believers information about our community. Although we are not there to seek confrontation, we occasionally are approached by believers who are angry that we even exist! We are there for other fence-sitters to discuss the ad vantages of non-belief. Although controversial, we decided to be at the pier on Christmas day 2013 to give passersby information on the origins of Christmas. You can see several here: Why is Christmas on Dec 25? Origins of Xmas Traditions When was Jesus born? Starting in July 2011, backyard Skeptics, with the help of a contributor, started placing billboard of non-belief in orange County CA. Each month we had a different billboard in a different area, and many received much press. Backyard Skeptics membership doubled within 6 months to 666 (or close to it). We now have over 1000 members (as of 12-13-13) and six different chapters. Our last billboard went up in Huntington Beach May of 2012. Our contributor has moved onto other organizations but we hope to find another one soon.